You might know the Lord of the Rings series like the back of your hand, but how well do you know the novels' author, J.R.R. Tolkien? 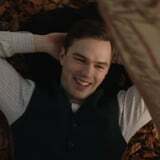 If your answer is "not very well," then you should make a point of seeing the upcoming biopic about the writer's life starring Nicholas Hoult, aptly titled Tolkien. The official description of the upcoming drama notes that it will explore "the formative years of the orphaned author as he finds friendship, love, and artistic inspiration among a group of fellow outcasts at school." Although the first teaser, above, is brief, we can already see the connections between Frodo, Sam, and the rest of the fictional band of friends to Tolkien and his real-life pals, whose relationships suffered after the outbreak of World War I. In addition to Hoult, the film stars Lily Collins, Colm Meaney, Anthony Boyle, Patrick Gibson, Tom Glynn-Carney, Craig Roberts, and more, who all play people whose interactions with Tolkien eventually inspired him to write his famous Middle-earth novels. Check out the trailer, then be sure to catch it in theaters on May 10.